Curcuma malabarica Velay., Amalraj & Mural. Curcuma zedoaria (zedoary, white turmeric, or kentjur) is a perennial herb and member of the genus Curcuma, family Zingiberaceae. The plant is native to South Asia and Island Southeast Asia but are now naturalized in other places including the US state of Florida. Zedoary was one of the ancient food plants of the Austronesian peoples. They were spread during prehistoric times to the Pacific Islands and Madagascar during the Austronesian expansion (c. 5,000 BP). Its use as a spice in the West today is extremely rare, having been replaced by ginger, and to a lesser extent, yellow turmeric. Zedoary grows in tropical and subtropical wet forest regions. The fragrant plant bears yellow flowers with red and green bracts and the underground stem section, a rhizome, is large and tuberous with numerous branches. The leaf shoots of the zedoary are large and can reach 1 meter (3 feet) in height. The edible rhizome of zedoary has a white interior and a fragrance reminiscent of mango; however, its flavour is more similar to ginger, except with a very bitter aftertaste. In Indonesia, it is ground to a powder and added to make white curry pastes, whereas in India, it tends to be used fresh or in pickling. In Thai cuisine it is used raw and cut in thin strips in certain Thai salads. It can also be served cut into thin slices together with other herbs and vegetables with certain types of nam phrik (Thai chilli pastes). The showy C. zedoaria is occasionally used as a houseplant. The plant is used traditionally to treat inflammation, pain, and a variety of skin ailments including wounds, as well as menstrual irregularities and ulcers. The essential oil produced from the dried rhizomes of Curcuma zedoaria is used in perfumery and soap fabrication, as well as an ingredient in bitter tonics. The curcuminoid 1,7-bis(4-hydroxyphenyl)-1,4,6-heptatrien-3-one, and the sesquiterpenes procurcumenol and epiprocurcumenol can be found in C. zedoaria. ^ Kikusawa, Ritsuko; Reid, Lawrence A. (2007). “Proto who utilized turmeric, and how?”. In Siegel, Jeff; Lynch, John; Eades, Diana (eds.). Language Description, History and Development: Linguistic indulgence in memory of Terry Crowley (PDF). John Benjamins Publishing Company. pp. 339–352. ISBN 9789027292940. ^ Vermeulen, Nico; Rosenfleld, Richard (1998). Encyclopedia of House Plants. REBO Productions. p. 157. ISBN 9781579581084. ^ Ullah, HM Arif; Zaman, Sayera; Juhara, Fatematuj; Akter, Lucky; Tareq, Syed Mohammed; Masum, Emranul Haque; Bhattacharjee, Rajib (2014-09-22). 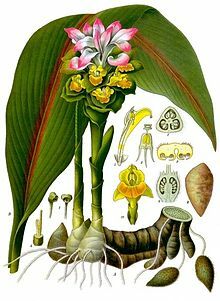 “Evaluation of antinociceptive, in-vivo & in-vitro anti-inflammatory activity of ethanolic extract of Curcuma zedoaria rhizome”. BMC Complementary and Alternative Medicine. 14: 346. doi:10.1186/1472-6882-14-346. ISSN 1472-6882. PMC 4190444. PMID 25242194.